Bison and gout is the 95th top topic in the Gout and You series. Bison is not one of the key foods that I currently include in my gout foods tables. However I did include some nutritional information in old pH tables associated with alkalizing gout diet menu. I have moved this detail to another website. [Update: I have updated Gout Foods Table for meat to include bison] The main point to consider is that bison, like most red meat is very acid-forming and needs to be balanced by around 3 to 4 times as much vegetables. Specifics vary between different cuts of red meats, and how they are cooked. The general nutritional advice about bison is that, as with all red meat, it should be eaten sparingly. Despite the advice to limit red meat, there is a view that bison is “healthy.” This is misleading, because the articles that explain this make it clear that bison is a healthier alternative to beef. But planning a diet for gout means looking for better alternatives without losing enjoyment. So can we improve our gout diet by swapping beef for bison? Purine information is not available for bison, but there is no reason to think that it is any different than any other red meat. Other key nutrients covered by my current gout foods tables are little different between bison and other red meats. However, there is one nutrition factor that might be better than beef, and it is particularly relevant to gout. Is Bison Better Than Beef in a Diet For Gout? Recent investigations into the nature of gout attacks suggest that fatty acids play a stronger role in gout that purines do. Fatty acids are very complex, and during digestion and metabolism there are several interactions with fatty acids and our bodies. I expect future research to make the relationships clearer, but it is clear from what we know already that fatty acids are strongly linked to inflammation. Some are “good” fatty acids that limit inflammation, but there are also “bad” fatty acids that promote inflammation. Low level widespread inflammation is also linked to heart disease, especially through affects on blood vessels. Therefore, many investigations into cardiovascular inflammation are also relevant to gout sufferers. Two recent reports indicate that bison is much less inflammatory compared to beef. This is not to say that bison meat is anti-inflammatory, just that it might not cause as many problems for gout sufferers as beef can. CLA [Conjugated Linoleic Acid] also is believed to be anti-inflammatory ( Pariza 2004 ) and inflammation is the first step toward undesirable chronic disease outcomes. Clearly, what we now need is a specific study into bison meat consumption and gout. In the meantime, if you have experiences of bison and gout, please share in the gout support forum. 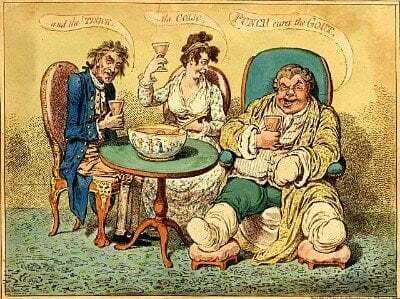 I will publish the 94th topic in my top 100 gout searches tomorrow. Please subscribe to the free gout update service to make sure you don’t miss them.